COMCASH ERP is a complete retail management system ideally suited for multi-channel and multi-location retailers. The software is cloud-based, allowing access to the administrative functions from anywhere on any device. 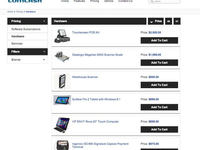 COMCASH offers a true omni-channel experience for the consumer and a unified commerce platform for the retailer. 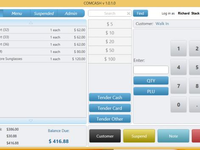 The POS application is Windows-based allowing for great compatibility with existing hardware and has an essential offline mode. 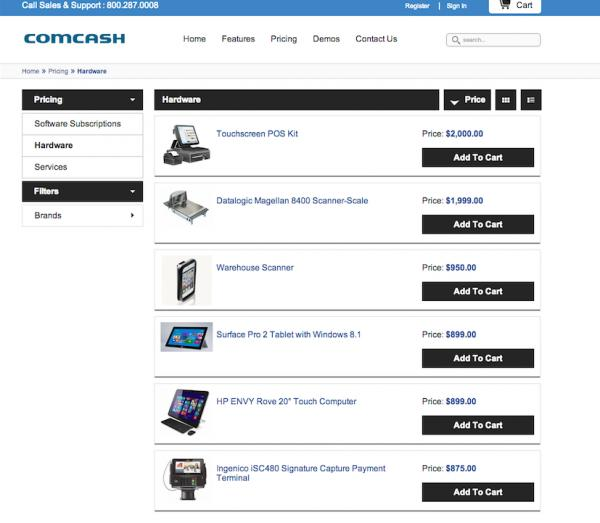 COMCASH Retail ERP Reviews Recently Reviewed! - Has so much potential that has yet to be unlocked or taken advantage of. However they do a great job to constantly keep pushing out updates. If you push your recommendations you will see them integrate them into the updates. - With these updates comes various bugs that you must bring to their attention. - Their tech support/help seems to not necessarily help with the in depth issues that I run into. They are a good help to get through basic issues and anything that may cause downtime, however, any in depth issues must be taken back to the development team by the first line. Despite this they are very attentive and willing to help and try to get the correct answer/person. -Comcash Counts app seems to have a few bugs constantly that I am trying to address with them. Overall: Overall remote location management has become much easier for multiple locations which will allow us to grow without the worry of a solid POS and inventory management software. Pros: Easy to use, easy to train people to use. Crystal Reports is a good foundation. Does not require me to update software on a regular basis. Customer service/Tech Support has always been good. I've been with Comcash since 2001 (a long time!) and it was a great deal when I set it up. 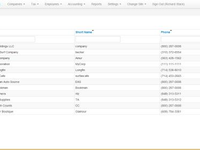 Use mobile scanner to update inventory and the management reports for what I need. 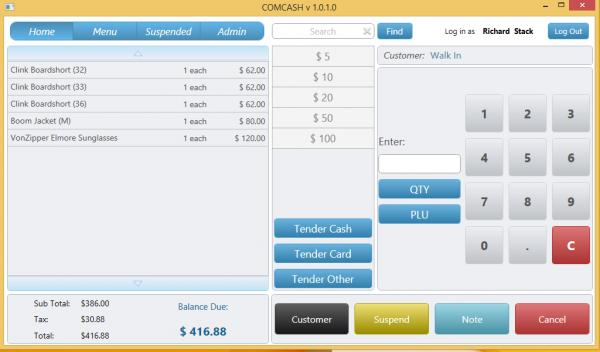 There are many capabilities that I don't use, but there is no off the shelf POS system that is less bloated than Comcash for the $$. Cons: Every time a pc changes, e.g., operating system, peripheral, etc. Comcash requires me to get a new code. This is a royal pain. Also, the reports are more complicated now than in the past. I can no longer get a monthly sales summary in dollars of what was sold by category or department. Recommendations to other buyers: Be sure you know the POS applications that are critical for your business: types of reports, what to measure, capabilities of staff using software, integration with accounting software, e.g, quickbooks; inventory valuation, website sales. Pros: Cloud based, easy to use, reliable. Data is secure and backed up. Comments: Ive used this program for about 2 and a half years now on both apple devices and microsoft touch pos systems and I am very satisfied with it. Especially when compared to some of the other more expensive products out there today. Pros: I like that the company behind Comcash is constantly updating and looking for better ways to make their software easier to use and keeping it user friendly. Cons: The reports and print out section of the program could be improved upon especially when using Apple products. Hands down the Retail ERP!!! Pros: Everything!!! Extremely versatile, can use, and access from anywhere, as long as you have internet access! Absolutely a breeze to use! Easy to train staff on how to use! Amazing feature loaded software! Cons: Price per computer per month! Kind of pricey! Comments: The developers of the software are very competitive and constantly stay on top of advancing the software. Pros: Easy to use. My staff loves working with the software. Also, it is a pleasure working with Comcash's support team. Comments: Overall in e the initial grunt work is complete the system provides an absolutely great way to keep track of sales, transactions, and inventory. Pros: The cloud based backlffice system is great. It really makes it easier for multistory standardization. The ability to create custom labels is fantastic. So there is no need to create labels from a superset system. Cons: There are a few features lagging. And the initial setup can be cumbersome. Small details are still not how I would like them even. Despite this the system works great. For example, even when placing a "temporary price" for an item I put on sale it does not allow for an end date past the current year. There are small issues like this but again I stress that this system makes everything so much easier. One huge con, which is not necessarily comcash issue more vantiv, is that EBT is not integrated into the processing system. We're very glad we selected this product out of the 14 POS systems we reviewed. Comments: In addition to the updated functionality that has been added in the past year, we are looking forward to using the innovations in warehouse management and mobile POS. Pros: Ease of use, ease of training volunteers using the terminals and customer service are the most valuable features to us. Cons: Some features we need for our somewhat specialized application of the product are not yet available but their programming personnel have been steadily adding features on our request list. 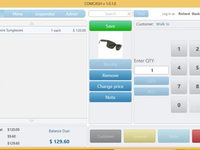 Pros: COMCASH Retail ERP is quick and easy to use. I like the feature of storing your gift card instead of paying someone else to do it for you. Cons: COMCASH Retail ERP has a problem handling EBT card. Overall: COMCASH Retail ERP has done an excellent job of finish the customer's purchase. Support is outstanding and work hard to fix the problem. Comments: We're a small grocery store. We came from a server based and much older POS system. 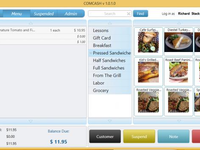 COMCASH was the only cloud based solution that seemed to answer most of the grocery requirements. Software that could handle complicated inventorying specifics, many different types of product input (deli scales, produce, recipes, ect) Their hardware options are quite nice (specifically the scale/scanner) Still in the setup process but will update this review in a few months after actually using it with customers. I LOVE COM CASH SYSTEM ABOVE ALL THE SERVICE IS GREAT. Comments: I LOVE THIS COMPANY BECAUSE THEY ARE ALWAYS TRYING TO IMPROVE. Pros: VERY EASY TO USE SYSTEM. COMPANY IS ALWAYS THERE TO LISTEN TO YOUR SUGGESTIONS. THIS COMPANY IS ALWAYS TRYING TO IMPROVE. Cons: MISSING FEW VERY VERY IMPORTANT REPORTS. THAT IS THE ONLY THING I DON'T LIKE ABOUT THIS SYSTEM. I AM VERY HAPPY WITH THE REST. Comments: We used this for a full year and were never able to make it valuable for our business. We had to reinvest in a completely new software. Pros: There is not a redeeming feature. No Pros. Regret buying it. Replaced it after 1 year. I would not recommend it. Cons: Does not interface with Quickbooks as described. Very few reports of value. I think an old-fashioned cash register would have been better. I am sorry you had a bad experience with our old Comcash Classic product. This product was developed in the 1990's so it will have an interface from that era. Our ERP product is what is listed and described on this site and you will see it has a very modern interface and many redeeming features. I followed up with our reseller and understand that the product you switched to from Classic is also not up to scratch so maybe you should look at our ERP product. Comments: everyone with the company has been very responsive to our questions! Comments: We are new to Comcash from QBPOS. We are excited about the possibility for customization, web-based software, and great customer service. They are always helpful and eager to answer our questions. Pros: Customization and customer service. Also that we can use our own hardware. Cons: Leaving a hardware-based program for a web-based program is a little scary. Recommendations to other buyers: Do your research to make sure whatever you choose is the best for you. Pros: The thing I love about this product is the simplicity and ease of use. It allows me to easily access my store from anywhere to check on my inventory, sales, or employees' activities. The service at COMCASH surpassed my expectations without skipping a beat. They customized the software to work for me, not the other way around. They were able to taper the software to meet my needs. Cons: Absolutely nothing. I don't have anything bad to say about the product or vendor. Recommendations to other buyers: I would recommend to stop evaluating and go with COMCASH. You will not regret it. Pros: Very user friendly system. 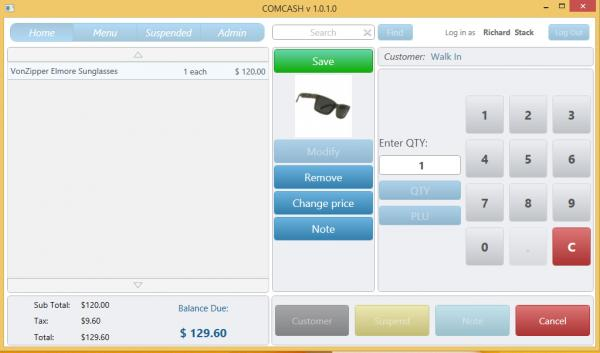 Comcash is able to make changes to the program to fit our store needs. Would highly recommend to others. Cons: The technical Bugs. But we have been able to deal with every bug so far. They are found and fixed in a timely manner. None have made us stop production. Comments: Transition from our old system was done very well with very few problems. We found this system straight forward to implement, and it has proven to be very effective. 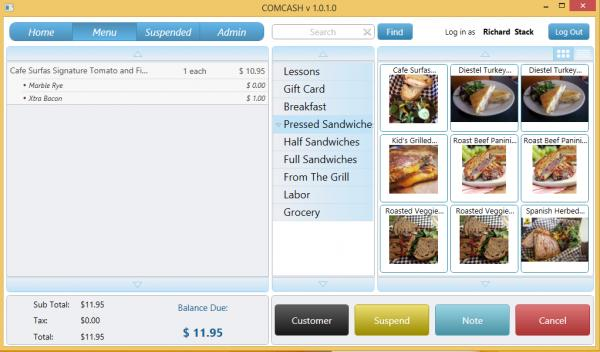 Pros: We found ComCash easy to deploy and employee training went quite smoothly. We like the interface, and the screens work well. Pros: I like the sales time stamp and inventory control, as well as the employee time control and sales. Cons: The setup can get rather difficult. Recommendations to other buyers: Each business is different, all I can say is research all software packages. Pros: Easy to use and figure out how to you. Like the all in one system. This provides your basic needs for a small store. Cons: Like I said, it's basic. Pretty bulky and is an eyesore compared to the square. But you get what you pay for. Pros: Fast ..Agent follow up with you and your search....and give you exactly what you looking for and rest is up to you.